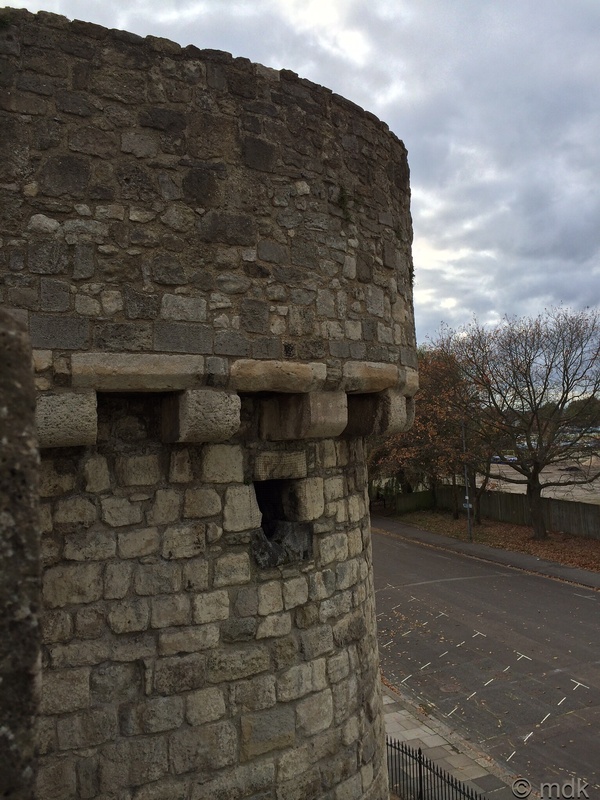 For my Sunday walk I decided to revisit an old friend, the medieval Southampton walls. They’re a backdrop to the city centre and one most of the people of Southampton walk past every day without really noticing them. I’ve been guilty of the same myself in my time. When I was working in the city centre I often spent my lunch hour wandering around them but it’s been a while. I’ve missed them. 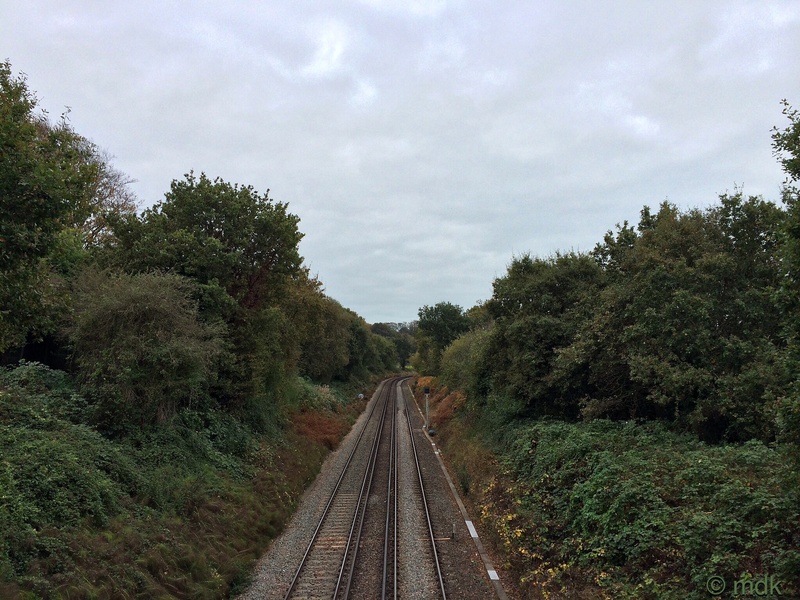 The walk into town was one I took every day to work for eighteen months, across the little railway bridge, along the river path and up onto the embankment of the Big Bridge at Northam. It isn’t the quickest route but it’s certainly the most scenic. 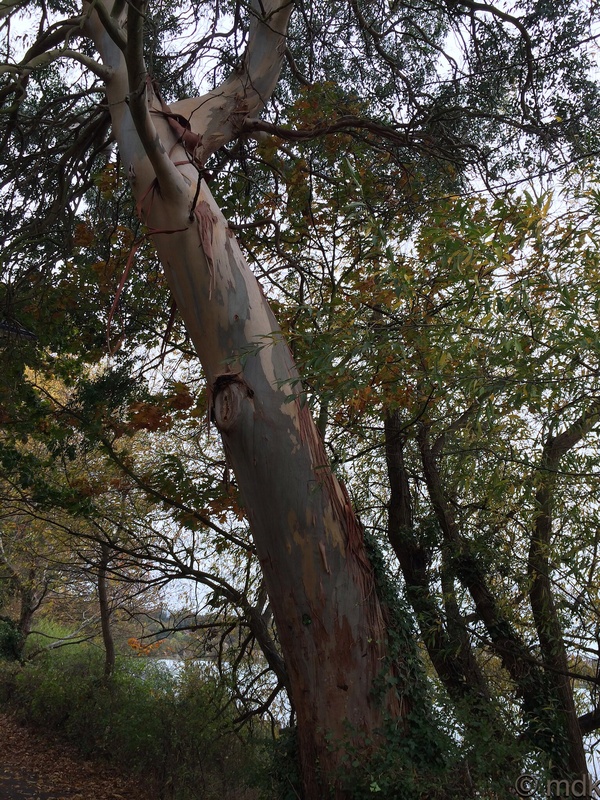 The eucalyptus tree was shedding strips of brown papery bark as I passed, leaving a smooth greyish brown trunk. The path was hidden under a combination of bark and fallen leaves. On the embankment the leaves have almost gone from the white beam trees and I stopped for a moment to look over the stone wall at the skeleton ship. There seems to be a lot less of it since I last came this way. As far as I can tell it’s an old coal barge, used to transfer the coal to and from the big ships as they came into port. Its age is anyone’s guess but it’s been rotting on the bank all my life. Of course I also had a look at the moss and lichen growing on the old stones of the wall. Crossing Palmerston Park I couldn’t resist a quick detour into the enchanted park. The leaves have been disappointing this year, I guess it hasn’t been cold enough, but there are still a few hardy flowers hanging on here. 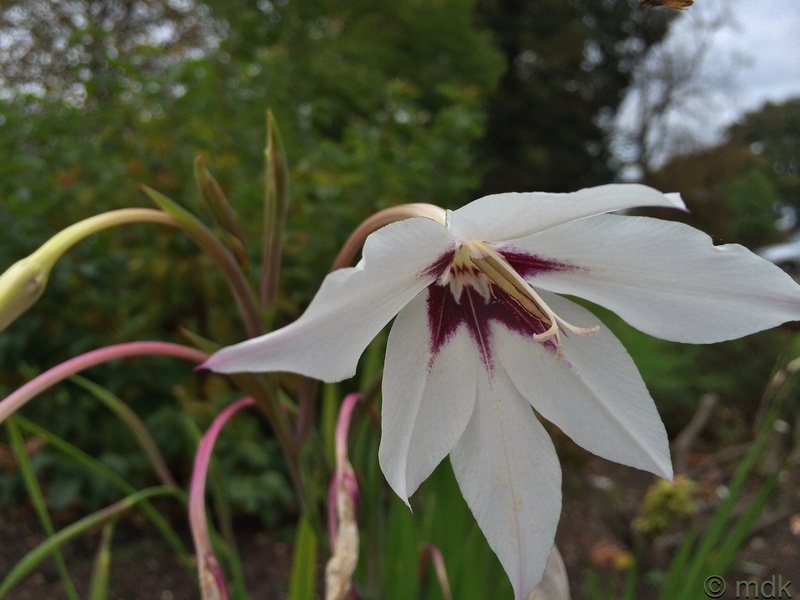 There are clumps of gladiolus murielae, a little ragged around the edges but still bearing the odd white flower with burgundy centres. One or two of the hydrangeas are still going strong too and a drowsy bee was gathering as much nectar as his legs could carry. The real draw for me though were the skeletonised hydrangea flowers. Such delicate beauty in decay. My first historic port of call was the Bargate, symbol of the city and once the gateway to it by land. 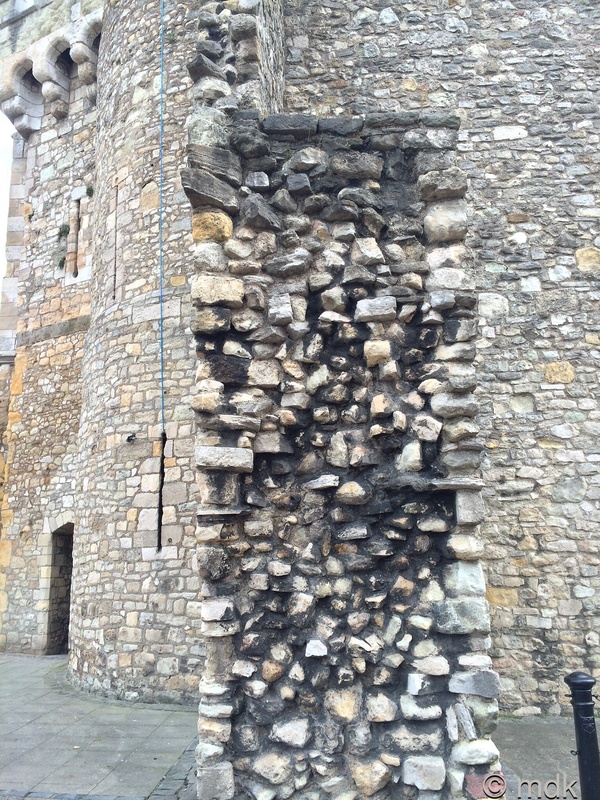 Built around 1180 of stone and flint, it was one of the first parts of the town walls to be completed. The stones beneath the arch are worn smooth from the thousands of feet that have passed through. In medieval times lepers from the leper colony at nearby Marlands would have stood outside begging. In the twenty first century homeless people do much the same. The arch is guarded by two lead lions, the oldest statues in Southampton. They replace the original wooden lions and date back to 1743. In 1415 the four main conspirators of the Southampton Plot, aimed at killing Henry V, were executed here. The three ringleaders, Richard of Conisburgh, the Earl of Cambridge and Henry Scrope were beheaded but poor Sir Thomas Grey was hung drawn and quartered. A busker played banjo and sang quite beautifully under the arch as I passed through as so many minstrels must have in the past. From inside the old city the building seems more church like with four leaded windows and a bell. Between the windows a statue of George III, dressed as a roman emperor, looks down on the comings and goings. This was erected in 1809 to replace a wooden statue of Queen Anne. Now I was inside the old town I followed the line of the walls to the west. There is a gap here, cut in the 1930’s for the road to run around the outside of the gate. It seems such a shame that the whole wall wasn’t preserved but it does serve to show just how thick and strong the walls were. Across the road I made for the modern bridge across another breach, cut for another road, Portland Terrace. It’s quite an elegant bridge but, personally, I’d have preferred it if the walls had remained. Climbing onto the bridge I spotted some rather ancient graffiti. It never ceases to amaze me how I spot new things every time I walk these walls. On the battlements here a bronze statue of John le Felmyng, the mayor of Southampton from 1315, looks out towards WestQuay. This was built in 1991 by Anthony Griffiths. I can’t help wondering what the man himself would have made of all the traffic passing beneath his wall today. Over the bridge I climbed the steps to Arundel Tower. 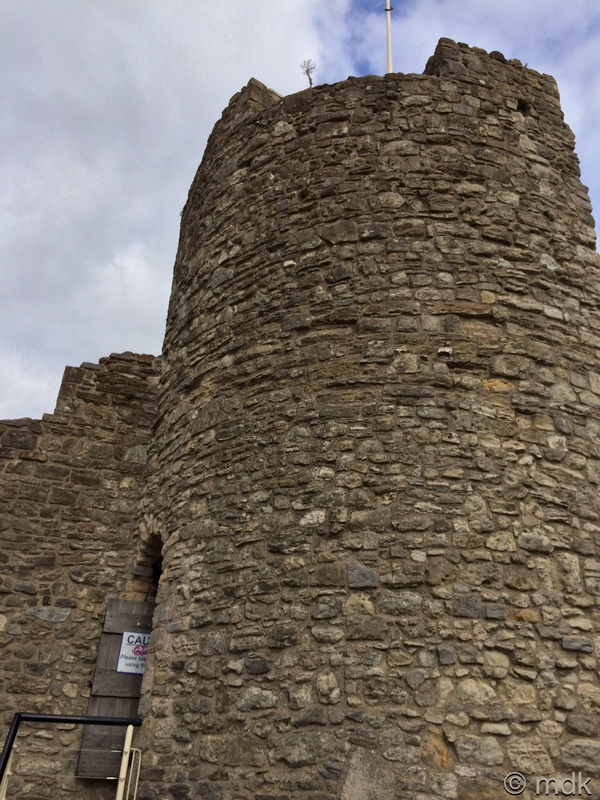 This sixty foot high tower was built in 1290 and was named after Sir Bevis of Southampton’s horse, or possibly Sir John Arundel who was governor of Southampton Castle in the 1370’s. It was nicknamed wind whistle tower, for obvious reasons. These walls were patrolled by the Guilds, each having a particular section to defend. This section was the responsibility of the shoemakers, curries, saddlers and cobblers guilds. From the top of the tower the watchmen would have had a wonderful view of anyone trying to enter the town by sea although now it’s reclaimed land. Looking south along Western Esplanade I could just make out the sea in the distance. Once I’d have seen Southampton Castle behind the wall to my left. These days there’s just a tower block. Climbing down the modern spiral staircase I looked back through the arch towards the Bargate. An arrow slit gave me a different view of the same thing as did the arch of the lower doorway. Now I was on the battlements of the western wall. Looking over the top towards WestQuay it’s hard to believe the sea would once have lapped at these walls. In the distance a huge cruise ship shows where the shore line is today. For the time being the land between WestQuay and the Quays swimming pool is empty, but soon work will start on the second phase of the WestQuay development. A short distance along the battlements is Catchcold tower. Named by the guards who stood in the biting winds, it was built in the early 1400’s. The gun ports are some of the earliest in the country and, during World War II, it housed an anti aircraft gun. There is a door on the battlements leading inside the tower but I’ve never seen it unlocked and I’ve often wondered what’s behind it. Brass footprints show the preferred direction to walk these walls but of course I’m walking the opposite way. Bypassing the stone steps to the chilly tower, I walked instead to the top of the forty steps. These were built in the 1850’s when the shoreline here was a popular promenade. Until the second decade of the twentieth century it was still a popular place for boating, picnics and sea side walks. Then the land was reclaimed and it’s now a largely unused stretch of road. Now there was a choice to make, walk down the steps And outside the medieval town along what was once the shore or stay on the battlements and walk towards the castle vault. Tomorrow I’ll tell you what I decided. Thanks for the tour. I liked the Churchill quote. It was nice to walk in your footsteps for a while, including the footprints that went with the Winston Churchill quote. Your photos are lovely, but what impressed me most about this post is how young America is compared to Great Britain. We have nothing older than the 1600s. Your history goes way, way back! It was good to have you along. 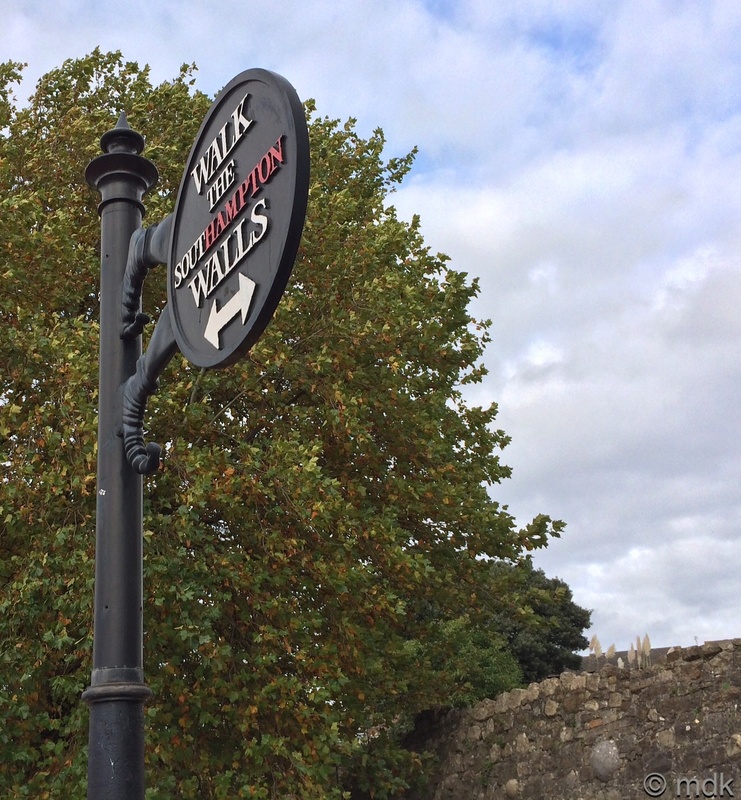 The city centre in Southampton has the second longest stretch if medieval walls in the country and quite a few medieval buildings still being used too. Tomorrow I’ll post about a few of them. Those are great lichens. I’ve never seen them. It must be fantastic to be surrounded by so much history. Maybe someday you’ll see that door opened by whoever has the key. There are some beautiful lichens on some of the old stones. There are also a lot of doors I’d like the key to. A grand walk in every sense of the word. I never get tired of walking the walls – it is great to hear it from someone else’s perspective. Funny how we walk past them so often without really looking at them. I seem to see something different each time.